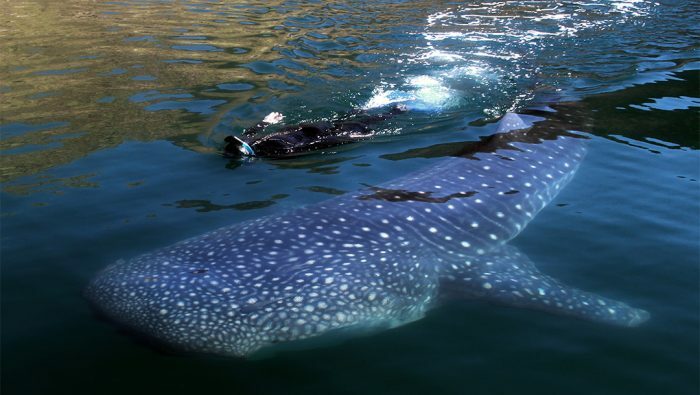 Whale Shark Tours: Aug. – Nov. Need a place to decompress in nature? 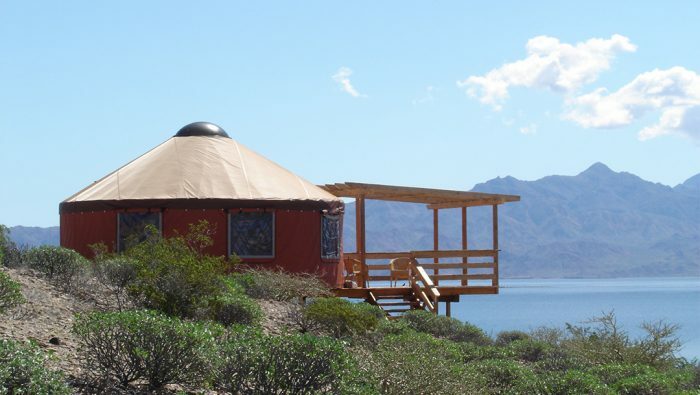 If you have dreamed of a secluded, magical Baja ecolodge retreat,…this is it Located on the Sea of Cortez and accessible only by boat, Las Animas Baja Ecolodge, is a year-round all inclusive, soft eco-adventure, multi-activity, wilderness glamping vacation destination ideal for singles, couples, families, and small groups up to 16. Here you can be as active or as relaxed as you want. 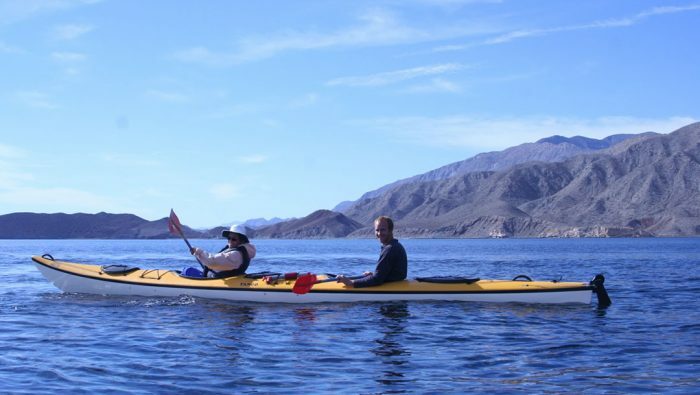 Your Baja soft adventure vacation memories are entirely up to you. 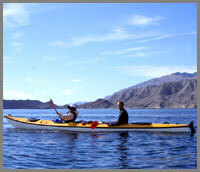 Kayak crystal clear waters and never-ending coves. Snorkel with playful Dolphins and Sea Lions. Watch in awe the majestic spouting whales. Great remote location, like being on a desert island. Food was excellent, yurts were very comfortable, and the scenery was incredible. We kayaked, snorkeled with sea lions, hiked the beautiful surrounding area and generally had a good time. Escape to your own secluded, romantic cove. Watch the more than fifty species of birds and 6 species of whales, including the blue and fin whales, the largest in the world. Learn to sail and stand up paddle (SUP) board. Climb with our guides. Explore unspoiled desert island chains. 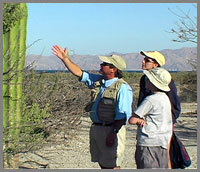 Beautiful easy walks in the very abundant and diverse Sonoran desert. 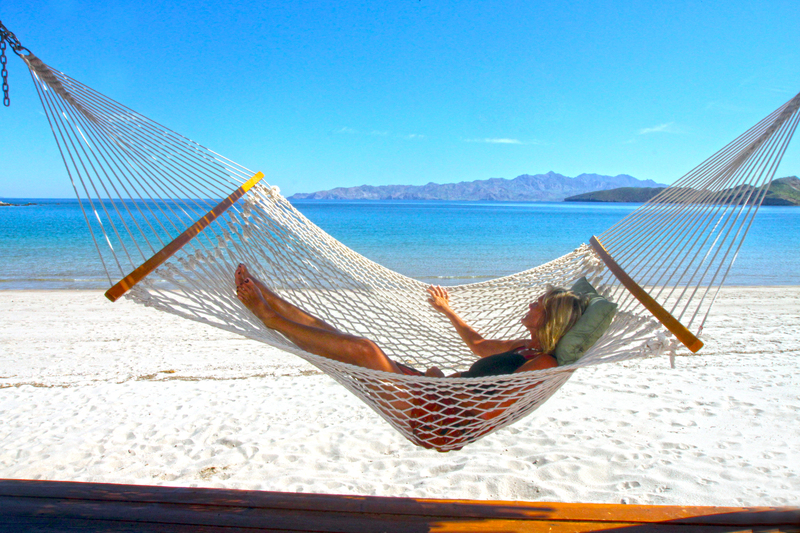 Or simply relax in a hammock and fall asleep to the sounds of the sea. This truly is a one of a kind experience! Check Out Our Ultimate Whale Watching Tour! 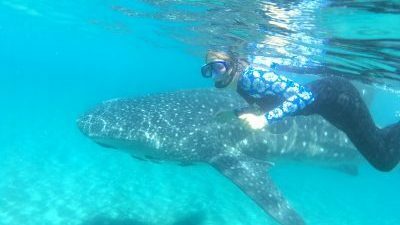 Snorkeling and Swimming with Whale Sharks Tours! 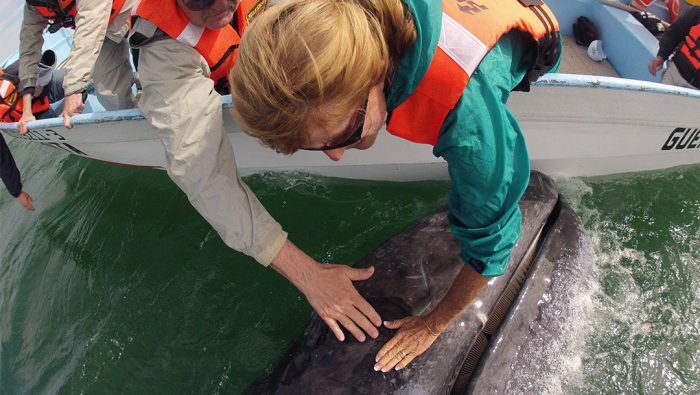 Best of Baja's Whales, Dolphins & Seal Lions Tours! 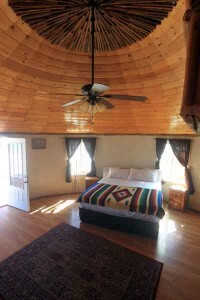 Our truly unique Baja ecolodge offers 7 romantic, private beach-side yurts equipped with bathroom, solar shower, composting toilets, comfortable Queen and King sized beds, covered decks and skylight roofs. 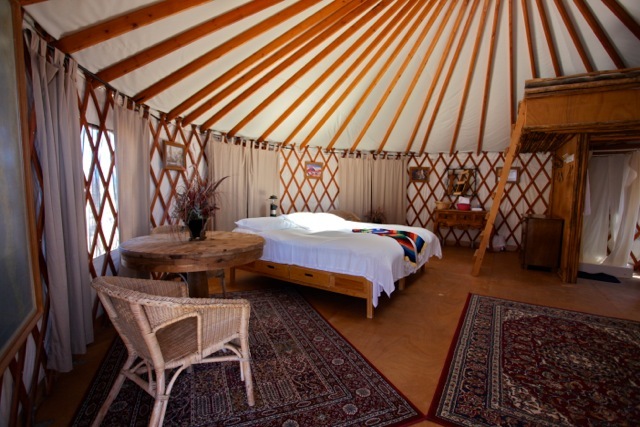 The yurts are built around the spacious main lodge yurt which offers an expansive deck that serves as a central dining area, game area and communal lounge space. 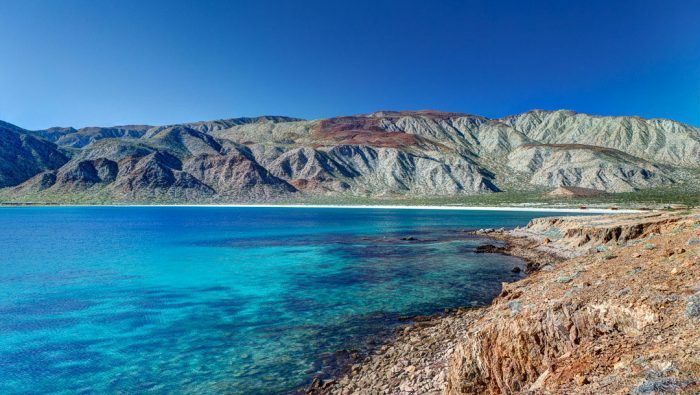 What else do you need for the Baja eco-adventure vacation of your dreams? Dates below are already set, plus more available! Call 800-221-9283 or 1-619-421-2235 (international) or Email for availability if date you want not listed. Call Kevin @ 800-221-9283 or 1-619-421-2235 (international) or Email for availability if date you want not listed. Nature at its best! Best trip ever! My daughter and I had a great trip last month with Baja Airventures. We saw almost too many whales to count in the first two days of the trip. And Las Animas was remote and beautiful. Swimming with the sea lions was an amazing experience!! Guide/ Pilots Fred and Andy kept us on the move…except for siesta time and happy hour. Lots of good food and conversation. Best trip ever! Can’t wait to travel with Baja Airventures again to see and swim with the whale sharks! Incredible food. Small groups. Rustic comforts, all found amongst the rare and protected natural habitats offered at Las Animas – Baja’s ultimate ecolodge. Experience the original, untouched Baja. 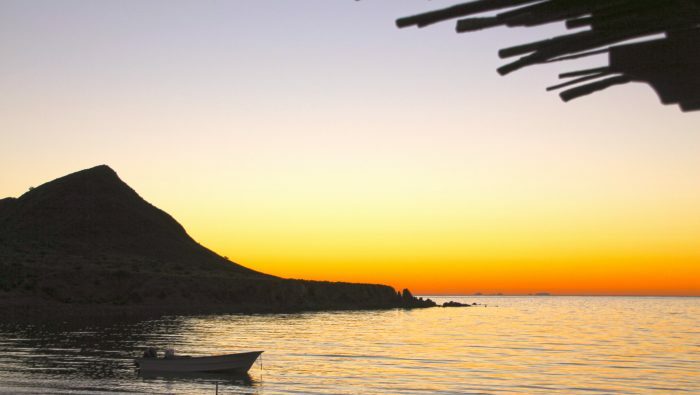 This oasis, hidden inside a breathtaking private bay, offers a natural alternative to the crowds and hotels of Southern Baja. 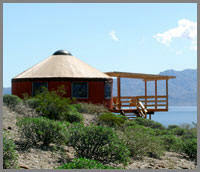 Come; experience a uniquely genuine Baja retreat. Private Groups and longer trips available. … one of my favorite travel destinations. 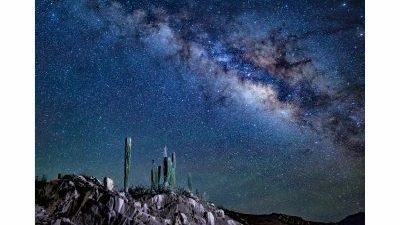 The Sea of Cortez is one of my favorite travel destinations. Las Animas ecolodge offers an ideal way to experience its incomparable combination of desert terrain and abundant marine life. The perfect mix of being pampered and roughing it a bit was just right, too. I cannot recommend this trip highly enough.